I remember watching the Mortal Engines trailer for the first time, at the press screening of A Quiet Place (I believe. I know it was many months ago) and thinking, hmm, this looks interesting… WOAH PETER JACKSON? Of course, as I found out moments later after doing a quick check on IMDb, Jackson, the helmer of some of the best films ever made AKA The Lord of the Rings trilogy, isn’t the director of this film. Nevertheless, I was curious to see what this visionary creative mind was going to bring to the table as far as writing and producing goes. Especially since his previous tango in the fantasy genre with The Hobbit saga felt like it was regurgitated by a Peter Jackson clone coming straight out of a factory in China on a conveyor belt. Also, 2018 has been a disastrous year for fantasy films not centred around comic book characters. The Nutcracker and the Four Realms and Robin Hood, was as expected, messy and tiresome. 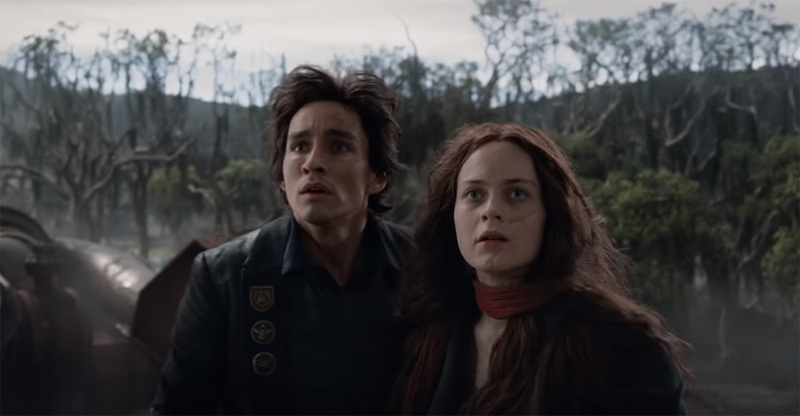 Solo and A Wrinkle in Time turned out to be aggressively ordinary affairs, while Crimes of Grindelwald felt like a stab in the back. Next to these duds, Mortal Engines feels like a massive, massive upgrade. And perhaps that’s low praise, but this Peter Jackson co-scripted film really does set up a fascinating and rich immaculate reality. We open with an expository voice of god. Hundreds of years into the future, a cataclysmic event has ended civilization as we know it. The surviving humans have rebuilt the world, but in a manner that’s very much different from ours. Director Christian Rivers then immediately tosses us into this near-Mad Max looking, desolate, steampunk world, where we witness a chase. But it’s unlike any chase sequence you’ve seen before. Here, we see a glorious mammoth city on wheels — a predator city, as they call it — hunt and devour a much smaller city as we hear the fervent and excited roars of its bloodthirsty citizens. Just like in Star Wars: A New Hope in 1977, we find ourselves not at the beginning of the story, but in the thick of it. We see a mysterious young girl (probably in her early 20s), wrapped in a red bandana, cowboy style, with a scar running across her face like the river Nile. Hester Shaw (Hera Hilmar) is our protagonist. She sneaks a knife onto London, past its burly security guards and recces the area. Her target: The majestically named, Thaddeus Valentine (Hugo Weaving). Immediately we get engulfed by the air of mystery. Who is Hester Shaw? Why did Valentine kill her mother? Yes, this is one of those chosen one narratives (that I will frankly never get tired of) where an unlikely hero on a self-serving quest for revenge finds herself entangled in something much bigger. Hester carries with her secrets of the past. Secrets that even she, doesn’t know yet, are important. It’s destiny as they say. The lore is great. Its themes aren’t revolutionary, but the world is unique and expansive, with interesting details at every nook and corner. There are archaeologists and historians who scavenge for rare antics like toasters and spark plugs. There are dusty and rusty mobile homes that camouflage under dirt and move like giant insects. Slaves that auction of wrinkly old ladies for gold coins. A chamber that houses a secret invention. Vast cities in the sky that are stunning to behold on the IMAX screen. A fortress where multicultural rebel soldiers take cover. A distinct looking Asian rebel who reminded me of Trinity from The Matrix, minus the tight leather outfit. Zombie robots with a fondness for children’s toys. And a museum which most prized possession is a statue of a Minion. (Oh this movie’s got jokes. But it’s also earnest.) There’s a possible world ending scenario and an action scene that’s reminiscent of the ‘Battle of Yavin’, but doesn’t feel like a cheap knockoff. The visuals are stunning. And they’re not just skin deep, either. This isn’t Jupiter Ascending — my god, whatever happened to the Wachowskis? There is more to the action. There are bones, there is weight, there is gravitas. There’s also vibrant colours and textures that pop against the murkiness of the mud and soil that span thousands of miles in this post-apocalyptic world. Accompanying these visuals is a bombastic musical score by Junkie XL that vibrates under your shoes. You would think, based on my review so far, that Mortal Engines has all the makings of a great fantasy film. But, I walked out of this movie feeling slightly disappointed. And that’s because Mortal Engines is missing one key ingredient: A good screenplay. It has skin and bones but not broiling red blood. This is a two-hour movie that should’ve been three. It’s condensed and moves at an unnecessarily rapid pace as if pages upon pages of the screenplay have been ripped out and flushed down the toilet. I haven’t read the books, but it feels as though many chapters of interesting story beats have been glossed over. The keyword here is interesting. Sometimes you watch a movie and wish they would cut the crap and get on with it. But this is a fantasy epic that warrants a drawn-out narrative that explores in depth its many distinct characters. Instead, a lot of what we get is just bland exposition. As a result, we’re not emotionally connected to the goings-on. When characters cry on screen, the music turns melancholy, but we don’t shed tears with the characters. We don’t even offer our shoulder for them to lean on, because we’re not invested in their journey on a personal level. Late in the movie, a character dies. A character who is interesting in concept — ruthless, morally ambiguous with a heart of gold. But these traits are said, not felt. Scenes come and go rapidly, but there are hardly any human moments. Moments that allow characters to just be. In one scene Hester tells her new friend, “I don’t want to talk about my past.” She isn’t ready to be open and vulnerable with him. A couple of quick scenes later, she’s opening up to him and pouring her heart out. But nothing happens during or in between these two scenes that make us understand and buy into Hester’s sudden change of mind. Few scenes later she’s in love with him. Once again, I don’t quite understand when and how this love blossomed. So it comes off as cheesy — oh, I rolled my eyes more than a couple of times. (It doesn’t help that our co-leads have absolutely no chemistry whatsoever). This is the kinda movie Mortal Engines is, though. There are broad character beats, without the character journey. No arcs, only points conveyed through exposition. Hugo Weaving is fantastic as the villainous Valentine, but he’s let down by mediocre writing. Think of one of the most iconic lines in the Harry Potter franchise. Taken out of context, it sure looks like a cheesy one-liner. Why then do we bawl our eyes out instead of rolling our eyes back? Because we’re invested in the characters, their struggles and their sprawling journey. 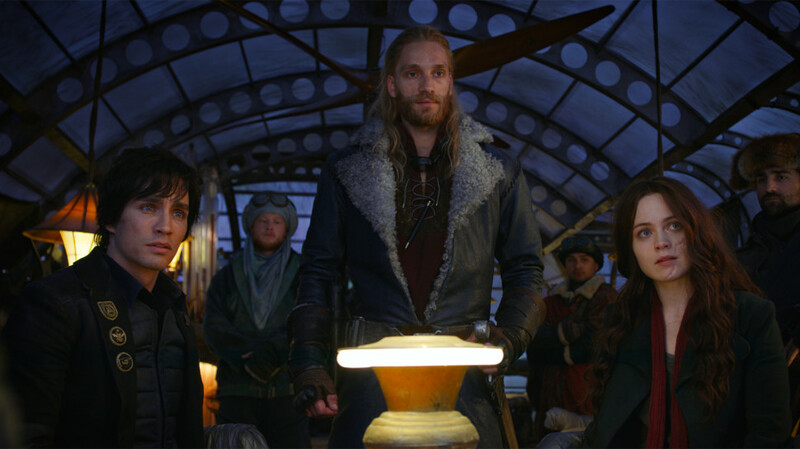 Comparatively, when we hear lines like “I will fly with you” in Mortal Engines, it feels forced, awkward and out of left field. And it isn’t just the characters and their non-journeys that feel condensed. Even the action sequences come and go swiftly. There’s an action sequence that takes place in a cloud city of sorts that is gorgeous to look at, but lacks the emotional sting. It also could’ve been 10 minutes longer. The same can be said about the climax. It would appear that post The Lord of the Rings, Peter Jackson (I know he isn’t the director of Engines, but he did contribute a significantly on the creative side) seems to have forgotten what made those films instant classics. It isn’t the note-perfect visuals, which help to sell its immaculate reality and contribute to the wholesomeness of the picture. It isn’t simply about the spectacle of watching thousands of fearless warriors taking on thousands of grimy Orcs. The Lord of the Rings is GREAT because of its characters and the epic and exhausting adventure they embark on. 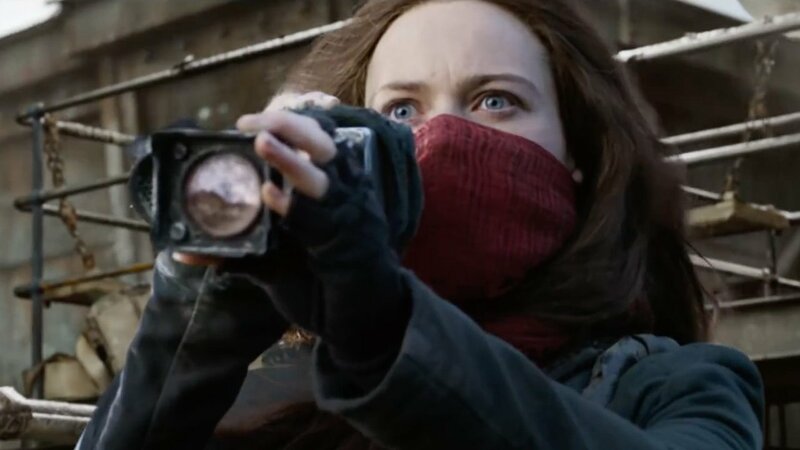 All great fantasy films have emotional depth and a beating heart at their cores, without which they wilt… like Mortal Engines. 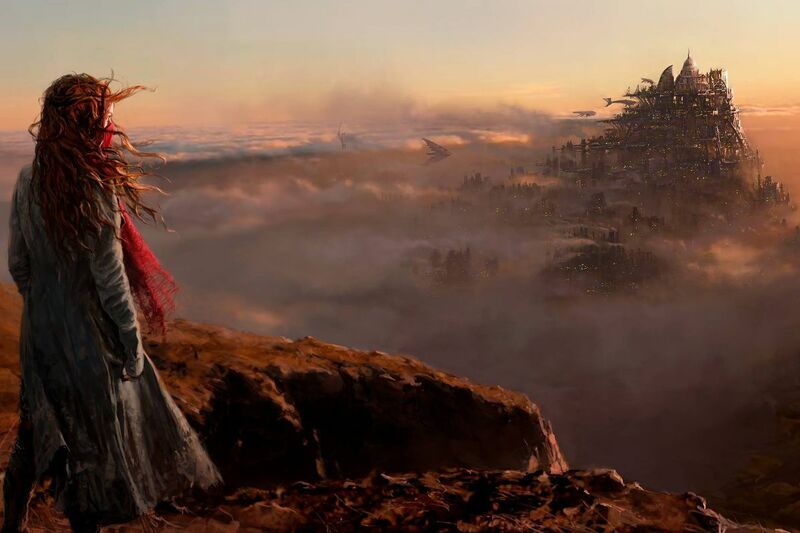 Mortal Engines is more than just skin deep. It has bones. But it lacks broiling red blood. It feels as though many chapters of interesting story beats have been glossed over.